s this your pretty, pretty princess bed," asked my husband? "Absolutely!" I answered!! Don't you agree? I nestled under the covers yesterday afternoon for a lazy, summertime nap. There was no way I could wait for bedtime to snuggle in my new pretty, pretty princess bed. It was mere hours after it was delivered. I took my time making it up in all white. So peaceful and serene. For more transformations, visit Susan@Between Naps on the Porch for her 32nd Metamorphosis Monday linky party! That is so beautiful. Very clean and crisp. Needs to be in House Beautiful! Gorgeous bed...I love the white bedding and the striped rug...I agree a princess bed indeed! Whe I say this, and listen carefully, I am not blowing smoke up your dress...your bedroom looks like an ad to sell the pretty, pretty princess bed! BTW, what does Tanner think? I love the new look1 What a pretty room to take your laptop in and curl up and cruise the blogs and get inspired! Thanks for your decorating inspiration....the white with wood is beautiful! Your bedroom is gorgeous! Love how you made up your room! Gosh, I miss that green rug! KIDDING!!!! Love, love, love the new bedroom. Did you ever play the game, Pretty, pretty Princess? FUN game, and your bed looks like a princess bed to me too! And what a lovely princess you are! Looks like plenty of room for Prince Charming, too! I WANT that bed! I HAVE that side table (white cart)....love what your room looks like! The room looks lovely, what a great job you did. And I love your pretty pretty princess bed. So beautiful! What a great, cozy spot-I can't blame you for wanting to snugle in all the time! It's looking amazing-great transformation. OOO--I want to sleep there! I don't know what is more beautiful, the bed or the linens! Amy, the bed looks scrumptious! Soooo comfy. Do you have a tv, refridgerator in the bedroom? Thinking you could just live there all the time! Just kidding. But I'd be spending lots of time there if I were you! Love it! I'm so glad the Princess finally got her wishes granted. You deserve about a week in that pretty bed after that Flea Market you just did. Enjoy your new beautiful space, and I for one am looking forward to the post with the details. 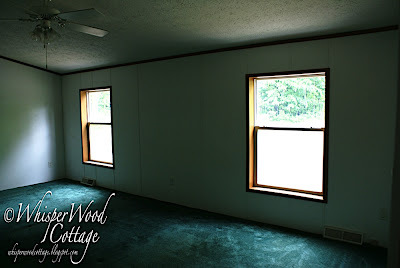 I'm interested in the hows and whats of the flooring as we are looking for new flooring for our main level. Your beautiful room is really coming together. Love the bed and lines too BTW. And, what a great way to reuse a vintage kitchen cart. So cleaver! I love your new bed. And I really like the all-white decor, it's very clean and fresh looking. Hey princess ALVN, get out of the beautiful as I have a question for you. Where did you find that linky party button on your side bar? Also, I finally got around to writing the thrifty shopping article on floral frogs. I referred folks to your Junkologie blog versus here. Do you want me to change it to link here? The article has gone live but I can change it. Thanks for letting me include your ideas and photos, and for getting out of bed to answer my question. Beautiful bedroom. 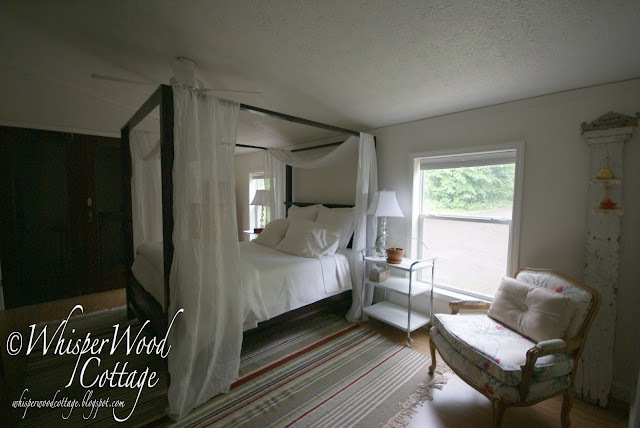 I have read again and again that a room looks even grander with a canopy bed...not sure how high your ceilings are, the canopy looks like it comes close to the ceiling,which makes the room look even cozier and charming. I redid my bedroom earlier this year, and would go upstairs just to look at it every hour or so...it is a wonderful thing to get the bedroom of your dreams. oh, i love this!!! love. It's beautiful, the bed and how it makes your room. How are you managing the ceiling fan? It's an issue in our room. Gorgeous! What a fantastic job!! Your room looks wonderful!! Love the bed, although, I'm surprised you didn't have your camera on a tripod with a timer, so you could keep nestling. Hee! So relaxing and pretty. Enjoy! Love the canopy bed! I've always wanted one too! Our ceilings are too low - your looks really great with your vaulted ceiling! You have done a wonderful job remodeling your room! I thought I was looking at a charming old cottage! Love how you're mixing old and modern, too! I love it. We have a 4 poster bed and I could do that. Ohhhh myyyy goodness!!! My friend, your master bedroom redo has turned out nothing short of fabulous!!! I remember seeing this room a few posts back and thought...what a lovely, spacious bedroom and I couldn't hardly wait to see what you did with is! Well, well...I am nearly speechless (well not really but you know what I mean...hehe!) I just adore everything about it...the fresh, crisp white wall color! Ohhh...and your new wood flooring is absolutely gorgeous!!! That just made a huge difference...I love, love, LOVE IT!!! And now...to see this fabulous room furnished...such a treat!!! My friend, your new "Princess Bed" is magnificent!!! It's just everything a girl could want...and Ooohhhh soooo pretty!!! It's perfect for your brand new master bedroom! I'm just so happy for you, Darlin'!!! All that fluffy white bedding is so beautiful and I love your area rug...perfect! Oooh...love that pretty chair in the corner of the room too!!! This is a F-A-B-U-L-O-U-S makeover!!! Thanks so much for sharing it with us! And I don't blame you at all for wanting to spend allllll that extra time in that gorgeous new bed!!! So sweet!!! Well my friend, just wanted to let you know that I read the sweet note that you left for me on my "Celebration Giveaway" post...thank you so much for stopping by! Would like to take this time to tell you thank you for following Happy To Design...it's been such a pleasure meeting you and I really do look forward to getting to know you better, my friend!!! PS...wishing you the best with my blog giveaway! Your room is beautiful! It's so light and airy. I love the new floor. You've come a long way, baby! It looks great! I would be napping all the time too! !Beautiful job! 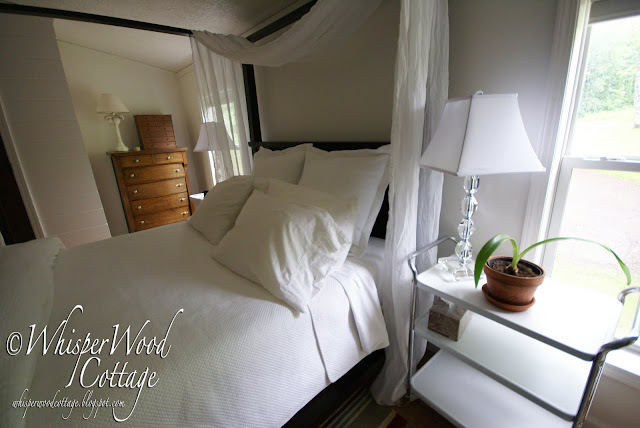 I have a dark mahogony bed and love it...been wanting to paint the side tables, but we'll see....lovely! post and so nice to "meet you"
Lovely! The colors of the room are so soothing. Beautiful. I love how you draped the top with fabric. I feel a nap coming on. Ooooh, I love it! So calm and relaxing, it does look like the perfect retreat. I love how your room turned out, just gorgeous. Your bed is GORGEOUS! Now, I don't want to get out of bed now as it is but there would be no way I'd ever want to get out of that bed! Your bedroom makeover is just beautiful. You're so talented! I love it! Ah, I hate to say it but it makes me a bit jealous. It looks so airy and romantic!! Oh Well--I need to work on my bedrooms...but I do spend little time there. Very beautiful! Can you please share with us more about the bed linens...they are beautiful as well.Thanks! Isn't that what every girl wants? I thinking about adding a canopy of some sort over the head of my bed. I just love the luxury and femininity of it. Your bed (and room) look gorgeous. I love how you've used so much white without it looking stark or boring.